You can pay less up front for an Xbox with a decent hard drive. Earlier this year, Microsoft came up with a novel plan to sell game consoles. 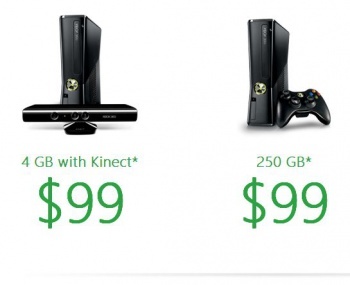 Rather than charge a huge bundle of cash up front - $250 for an Xbox 360 with a 4 gb hard drive - the new deal asked for only $99 and a 2 year contract for Xbox Live at $14.99/month. At the time, it seemed like a subsidized cell phone contract, something very common here in the States, but the small hard drive seemed too constrictive. It looks like either Microsoft realized that fact or enough people enjoyed the first offering because the company has added two options to its Xbox subscription plans: a 250 gb hard drive Xbox for $99 up front, and the same model with a Kinect sensor for $150. A two year Xbox Live Gold Subscription is still necessary to take advantage of these plans. In addition to the new plans, Microsoft teases more retail outlets that will offer this "Xbox 360 Entertainment for All" idea. Under a "Coming Soon" header, the company implores you to "Please check back later to see a full list of participating retailers." That most likely means you'll be able to stroll into a Walmart and walk out with an Xbox 360 for a hundred bucks. I find these plans intriguing. Game console-makers have always had a tough sell from the start. It's difficult to convince gamers to drop up to $600 - I'm looking at you PlayStation 3 - at launch when there isn't a library of games to play. With Microsoft shifting so much of its strategy to offering the full entertainment spectrum of TV, movies, sports, oh and games all on the Xbox 360, it makes much more sense to lock customers into a Xbox Live plan.